Pack contains x1 10.5 tog, polycotton covered.. 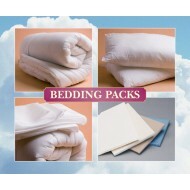 Pack contains x1 Double Percale Flat Sheet (p.. Pack contains x1 zipped Double Polypropylene .. Pack contains x2 10.5 tog, polycotton covered.. Pack contains x2 Single Percale Flat She.. Pack contains x2 zipped Single Polypropylene .. Pack contains x4 10.5 tog, polycotton covered.. Pack contains x4 Single Percale Flat She.. Pack contains x4 zipped Single Polypropylene .. Pack contains x6 10.5 tog, polycotton covered.. Pack contains x6 Single Percale Flat She.. Pack contains x6 zipped Single Polypropylene ..